What’s in a name? Everything to Irv Teibel. 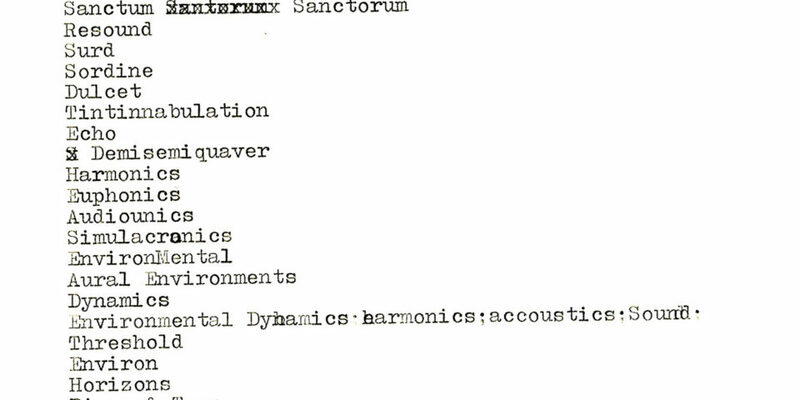 In 1968, as the environments series was in its infancy, Irv began drafting names for an organization to dispense these “instant environments,” as he originally called them. These sounds would be “heard rather than listened to,” harkening back to Erik Satie’s notion of furniture music and forward to the ambient works of Brian Eno. In addition, the LPs could be played at any speed—from 78 rpm down to 16 2/3 rpm—making them some of the longest recordings ever pressed on vinyl. Irv envisioned two ways to present this work to the public. One version played up the heady vibe of the late-60s, while the other, more serious in tone, stressed the psychological benefits of spending time digesting natural sound. He eventually moved in the latter direction while alluding to the former in a smattering of colorful testimonials on the jackets (“better than a tranquilizer”). In one of his earliest sketches, Irv encouraged himself to “invent a generic name such as Skye & Xerox.” Names that didn’t make the cut offer a humorous take on corporate naming cliches. 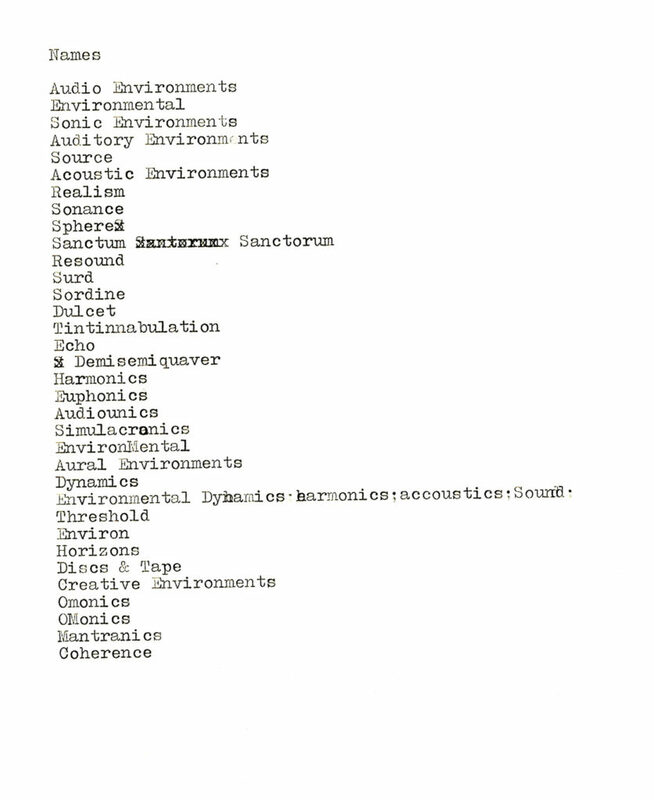 Take for example, “Hemidemisemiquaver,” the British name for a musical sixty-fourth note, or “The Coherent Sonance Corporation.” Then there’s “Sanctum Sanctorum, Inc.,” Latin for “Holy of Holies,” which skips over science and heads straight for mystical. Syntonic, a psychological term meaning in tune with one’s environments, captures a bit of that mysticism. 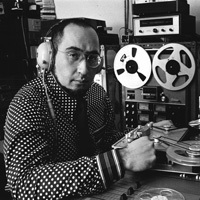 The composer and astrologer Dane Rudhyar used the phrase “syntonic music” to describe his vision for a more holistic and dissonant definition of music which would “communicate the psychic energy of actual tones.” Though Rudhyar never saw his “Syntonic Revolution”, Irv surely brought a bit of this attitude—with more playfulness—to his releases whether or not he ever read any Rudhyar. In these early sketches, Irv strikes a subtle balance between earnestness and humor, and he found that the name Syntonic Research, Inc. perfectly straddled this divide. While professional enough to be taken for a large institution, men in lab coats gliding about, the liner notes hinted that the producers were more self aware than your ordinary research laboratory (the tone is somewhat similar to Emory Cook’s label of the ‘50s and ‘60s). Over the eleven releases, the name Syntonic Research, Inc. set the tone as much as the distinctive design and layout. Irv often reminded interviewers that this was an idea who’s time had come. And people responded with letters of thanks and suggestions for which sounds he should release next. Probably the most surprising name that never appeared on his recordings was his own.